In 1976, the sensational revelations of an Italian journalist, Pier Carpi, showed to all humanity the existence of the prophecies of Angelo Roncalli (John XXIII since he was elected Sovereign Pontiff), that were found in an Initiatory Society. These prophecies were written in 1935, in the Pope's clear and poetic characteristic style, during his stay in Turkey after a series of supernatural experiences that allowed him to enter a secret society. A long list of events from 1935 to 2033 constitues the most exciting part of this work which has awakened strong polemics. - John 17-6 : I have manifested your name to the people whom you gave me out of the world. Yours they were, and you gave them to me, and they have kept your word. - John 17-7 : Now they know that everything that you have given me is from you. - John 17-8 : for I have given them the words that you gave me, and they have received them and have come to know in truth that I came from you; and they have believed that you sent me. Angelo Giuseppe Roncalli was born on November 25th 1881 in Sotto il Monte, in the region of Bergamo, Italy. Born in a family of peasants who cultivated a rented land, he was the fourth of 14 children (and the eldest of the boys), son of Giovanni Battista Roncalli and Mariana Mazzola. In 1892 he entered the Bergamo's seminary thanks to Giovanni Morlani (owner of the land cultivated by the Roncalli) and the Priest Rebuzzini's economic help. In 1895, at the seminary, he began to write his spiritual notes (which he would continue to do until his death), which later became part of the "Journal of the Soul". In 1901 he was sent to Rome, where he obtained a Master's degree in Theology, and at the age of 23, in 1904, he was ordained priest. 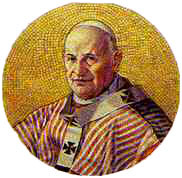 In 1958, after the death of Pope Pacelli, he was elected Pope and took the name of John XXIII. He was charged with renewing the Catholic Church by the Vatican Council II. The purpose was to open the windows so that the fresh air enters the Church. He wrote eight encyclicals in total, including « Mater and Magistra » (1961) and « Pacem in Terris » (1963), where he insisted on the rights and duties derived from the dignity of man as the creature of God. On January 3rd 1962, he excommunicated Fidel Castro. This initiative follows the condemnations expressed by Pope Pius XII in 1949. On May 6th of the same year, he canonized the first black saint of the Americas, San Martín de Porres. He was Roman Pontiff between 1958 and 1963. John XXIII was canonized on April 27th 2014, at the same time as John Paul II. EIn Italy he is given the affectionate nickname of "Il Papa Buono" ("The Good Pope"). 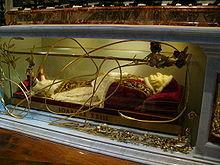 Tomb of John XXIII in the Basilica of St. Peter in Rome. When his body was exhumed in the year 2000, the rumor spread that his body was intact. Subsequently sources from the Vatican have rushed to deny the rumor that he had been embalmed after his death. His body now rests in St. Peter's Basilica in Rome.